First, the summary…What we’ve been building to are three suggested disciplines to unleash your whole self and creatively engage the other. Three disciplines that can help us “rewire” our brain based on a different set of responses than those provided by our limbic system. The first is to detach from your story…to gain distance and develop your “observer” so that you can stand back and look at yourself more objectively. We've already had a small experience of this today. When our story is mostly unconscious, it can get us all tangled up, making it hard for us to be responsive and creative. And as you may have experienced in our storytelling exercise, simply taking the time to tell our story helps us to “un-tell it”…to loosen its hold, to make it more objective, more observable, as if from a distance. And as we saw earlier, when we're able to look at something from a distance, we gain wisdom. Second is to expand into your un-story…to connect more intentionally to your un-story self…to get to know it and trust it. You won’t let go of your story if you don’t trust that there’s something more. We’ve been introduced to a few ways to do that: Learn the story of the other. Spend time in awe and wonder. And practice gratitude. The benefits are hard to over-emphasize. By connecting with our un-story we expand our perspective…we take in the bigger picture. We begin to see that we are so much more than our story, and we begin to identify with our “larger self,” which is the self we all have in common. That’s something to think about. You know what the word "identity" means, taken back to its Latin root? It means "the same as." And if who we are is the same as each other, the same even as what the universe is, then this entire thing IS our identity. It is our “un-story." Looked at this way, our story-self is the product of tens of years. But our un-story self is the product of more than 14 billion years! To put that symbolically into proportion, imagine a marble the size of the earth. That represents your un-story self. Covering that marble is a thin layer of dust. That represents your story self. From that perspective, our identification with our “story self” is, for most of us, way out of proportion. Third is to create a new path forward, to make a new kind of response. 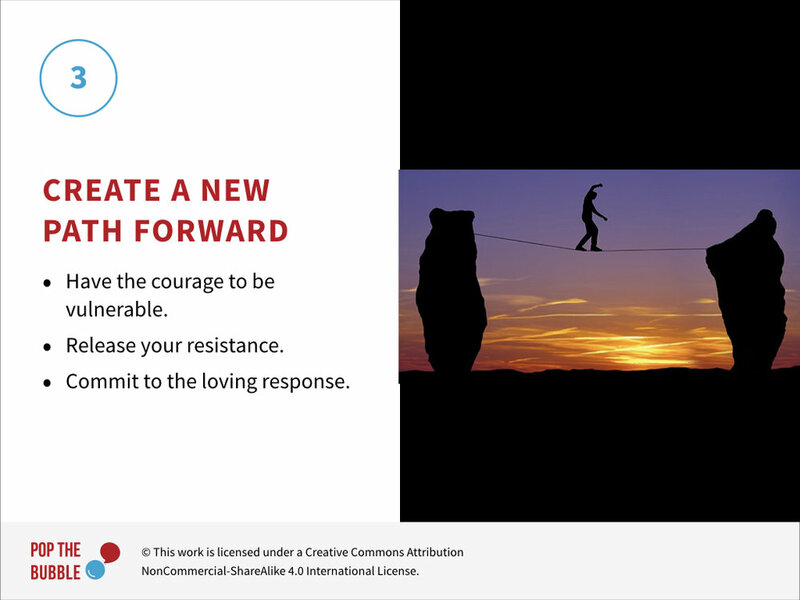 This means having the courage to be vulnerable by surrendering or releasing your resistance, which moves you out of your ‘story self” and into your un-story self, allowing you to be fully responsive to the needs of the moment. In other words, to make the loving response. 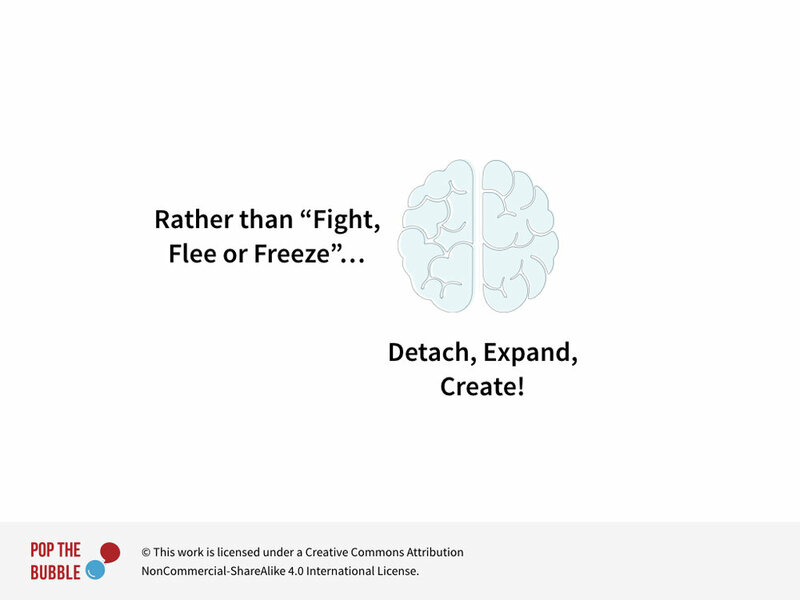 So rather than fight, flee or freeze when we feel threatened by an idea or perspective, instead we can choose to detach, expand and create. If you spend time meditating on these three disciplines, I guarantee you'll change. So let’s take a few moments now to reflect on what we’ve talked about over the course of the workshop. Take a few minutes on your own to think about what we’ve covered. What stood out or had meaning for you? What will you take away? Thanks everyone, for your reflections. Before you depart, I want to leave you with three quotes that I came across in researching this workshop, and that I felt in many ways made for a good summary. The first: "Overconfidence in our opinions is a failure of imagination." We all see the world through the filter of our experiences. It’s important to be humble, and to be open to other ways of seeing and understanding the world. 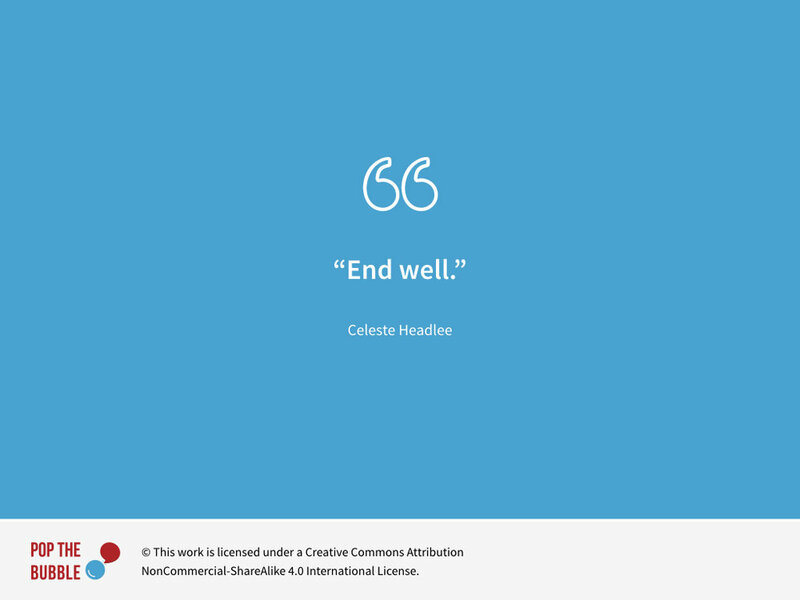 And finally, probably the most important piece of advice of all…end well. Let me tell you a quick story that illustrates the importance of this last quote. The psychologist Daniel Kahneman ran an experiment in which participants were asked put their hands in ice-cold water twice (one trial for each hand). In one trial, they put their hand in ice-cold water (57F) for 60 seconds. In the second trail they put their hand in ice-cold water for 90 seconds, but with a twist: the first 60 seconds were again at 57F, but for the last 30 seconds the temperature rose slightly, becoming two degrees warmer by the end of the additional 30-second period. The point: Even if a conversation turns out to be particularly difficult or stressful, strive to end it well. For example, at the end step back and express appreciation and gratitude that the person was even willing to engage. If you end it well, chances are they’ll remember the whole exchange positively, and be more likely to engage in future conversations that, who knows, may be end up creating real change. Just like it did in some of those “superhero” examples we looked at earlier! That's the end of the workshop! 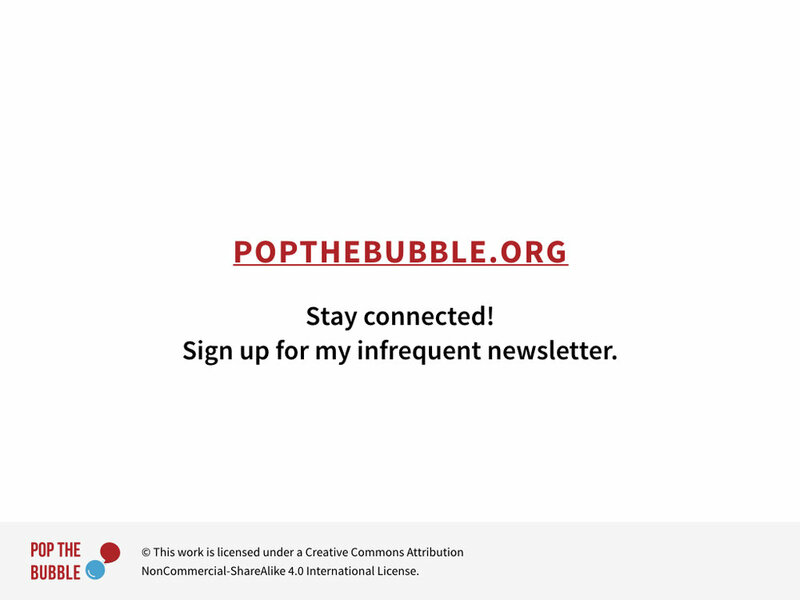 I want to remind you again that this entire presentation is up on my website, popthebubble,org, along with speaker notes. If you visit the site, be sure to register for my infrequent newsletter so that I can stay in touch.